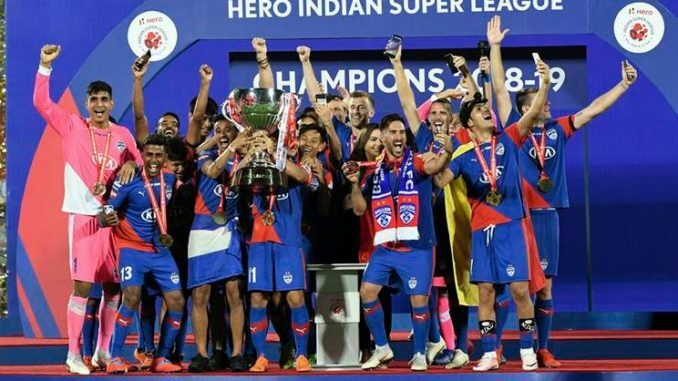 Bengaluru FC won their maiden Indian Super League title on Sunday at the Mumbai Football Arena by defeating FC Goa 1-0 in the finals. 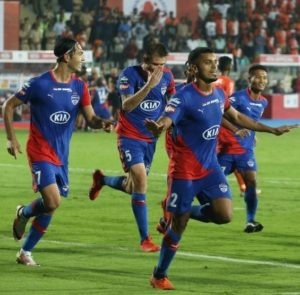 The game right from the start seemed like whoever got the first goal would win the title, and Bengaluru got that single goal. Rahul Bheke jumped to shoot a header into the far corner in extra time to get Bengaluru their maiden win. Both the teams throughout looked to take charge early but failed to shoot on target. Both teams had a fair share of tricks and shines, and none outshined the other. Corominas and Jackichand Singh led the attack for Goa FC, while Miku and Sunil Chhetri did it for Bengaluru. Goa got a great chance to shoot just before halftime, but that ended tragically. Both teams went into the half time 0-0. In the second half Goa took great guts to get a goal but couldn’t make it through Bengaluru’s defence wall. Both teams had a big chance to make it count in the 90 minutes, but unfortunately failed. At the end of the 90th minute both teams ended 0-0. When the extra time began, both teams had a huge threat. With much drama in the first extra time, it ended 0-0. During the second extra time, in the 118th minute Rahul Bheke with a brilliant header got Bengaluru a goal.